Founded in the year 2008, “Ivory Rug Creation” has emerged as one of the most prominent manufactures, suppliers and exporters of an exclusive range of varieties of Carpets and Handmade carpets include Shaggy Carpets, Hand- Knotted carpets, Nepali Carpets, Hand- Tufted Carpets, and Jute carpets. Wool Carpets, Hand Knotted Kush, Brownish Jute Carpets, Designer Nepali Carpets, Premium Shaggy Carpets, Designer Shaggy Carpets, Self Designed Hand Tufted Carpets, Handmade Nepali Carpets, Simple Jute Carpets, Hand Knotted Wool Carpets, Simple Shaggy Carpets, Hand Woven Shaggy Carpets, Multicolor Shaggy Carpets, and many more. Our company consists of a huge infrastructure, which makes it large for setting up all the basic tools and machineries. These products are made by using latest equipments and advanced technologies. Due to the facility of the perfect infrastructure we are able to manufacture these products in a bulk quantity and export across worldwide. Being certified by D & B Number 86-429-7165 (Dun & Bradsheet) & by Carpet Export Promotion Council(CEPC)Membership No.-1737, world leading Information Company we are fabricating Carpets and handmade carpets are finely and vastly demanded by our clients. Our company team made these products in a proper and innovative manner. Our team experts and workers work continuously with each other to reach the goal of the business. With the able guidance of our mentor Mr. Abdul Aziz Ansari, our company products are widely appreciated by the clients all over the world. They are fabricated by the experts and the professionally skilled workers with the help of high- tech machinery and sophisticated technology using the supreme quality raw material. Our products are comprises to the standard of international markets. Our prime aim to serve customers with premium quality carpets, we have positioned ourselves amongst leading Nepali carpets suppliers from India. We are also a well known shaggy carpets exporter. Our carpets come in enchanting designs, shapes, patterns and sizes; according to queuing of excellent manufacturing process. Our company is engaged in manufacturing, exporting and supplying a wide variety of home style products. The product range includes Hand Knotted Carpets, Hand Tufted Carpets, Handloom Carpets, Shaggy Carpets & Nepali Carpets. These products are manufactured using good quality raw material such as finest cotton fabrics in plaid, prints and plain design. All the finished products are subjected to final quality inspection and only after the set criteria are satisfied, are the products delivered to our clients. We are organized with a dedicated, creative, skillful, and adept workforce, which helps us in carving an enviable position in industrial market. We have a team of artistic craftsmen and trained professionals that made our products without any defect. Our team members are very dedicated to work and they work each other in coordination with a balanced speed. Our team consist designers, quality controllers, pattern master, expert tailors and fine cutting masters. We are manufacturer, exporter and supplier of a wide range of all kind of Carpets and Handmade Carpets include hand-knotted carpets, Shaggy, hand-tufted carpets, Nepali Carpets and Jute Carpets. These carpets are unanimously designed by the skilled craftsmen and are widely appreciated by our clients all over the world. 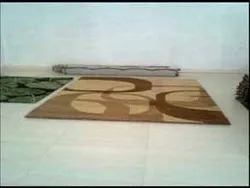 The carpets are widely used in various applications and give elegance to the place where applied. Our clientele is quite whopping comprising clients from USA, France, Germany, Turkey, Switzerland, Spain, Portugal, and London. Since our establishment we have marched towards glory and tackled many challenges that came in our way of success. Today, we are one of the most well-known companies in the modern period of time. We manufacture our products with the use of high grade raw materials to make the all kinds of carpets. Our material source is taken from a experienced and reliable dealers of the market. Our carpets are highly durable in nature available in various designs and pattern with a smoth finishing in it.